Yesterday was a travel day for me (a 3000 mile journey from Maine to California), starting with a three hour drive to Boston Logan, then an almost seven hour flight to SFO into headwinds. I got home feeling tired but blessed. No matter how long the day, any flight that lands is a good flight in my book. I hate flying these days. It used to be that we only had to worry about the plane breaking mid-flight but now we have much more to worry about every time we get on a plane. It didn’t help that the ‘Safe Travels” bracelet that my friend, Stephanie, brought me back from Israel was found on the floor, (meaning the threads broke) a few days ago. I don’t consider myself very superstitious but this kind of freaked me out. What if it’s an omen? I mean that bracelet has done a good job of keeping the plane in the air for more than a year! So in desperation true form I re-tied the strings into a makeshift, albeit awkward, bracelet and put it on my wrist. I’m now in California so it must have worked, Whew! So why am I telling you this? In deciding what to make for Wheatless Wednesday, I took stock of what I had on hand which wasn’t much since I haven’t been home in weeks. 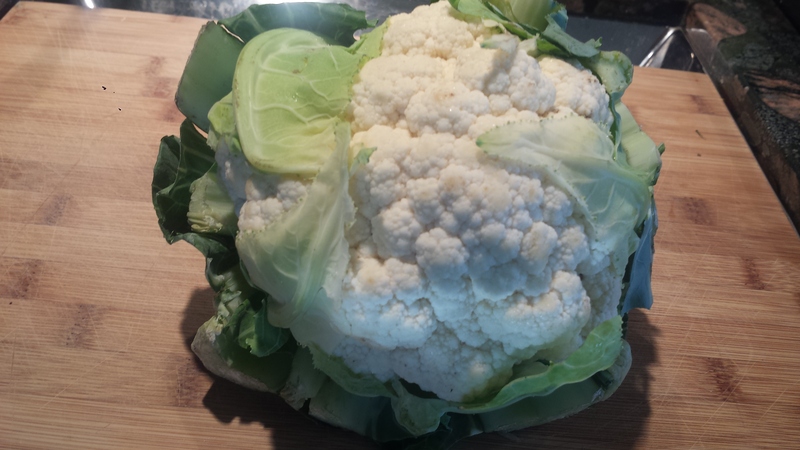 I had done a quick trip to the market for essentials and picked up a small head of cauliflower so I knew that was going to be my feature. 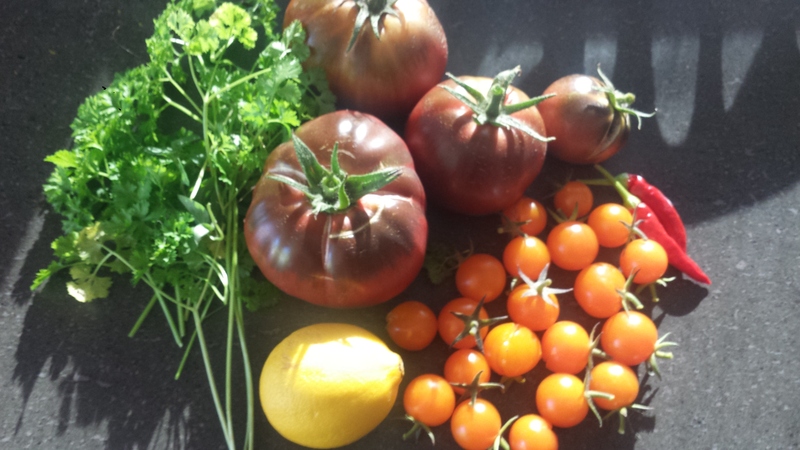 Then I went out to my garden and harvested a few large heirloom tomatoes, a lime, fresh herbs, a couple of red chili peppers and a handful of Sun Gold cherry tomatoes. 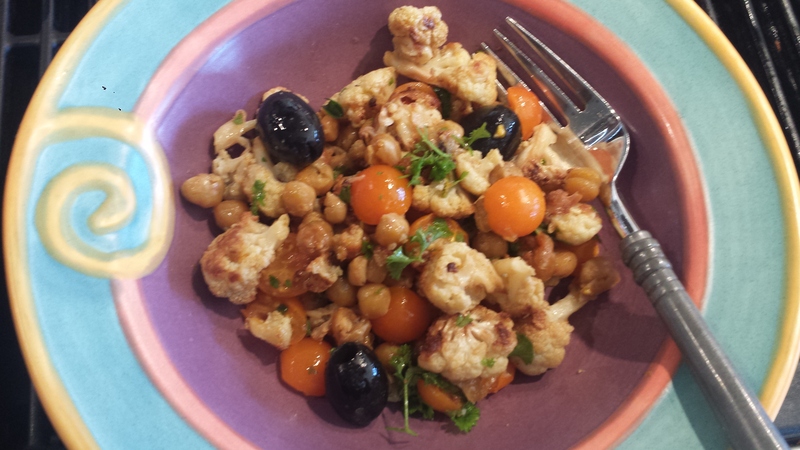 A quick check in my pantry yielded a can of garbanzo beans, so I was set. 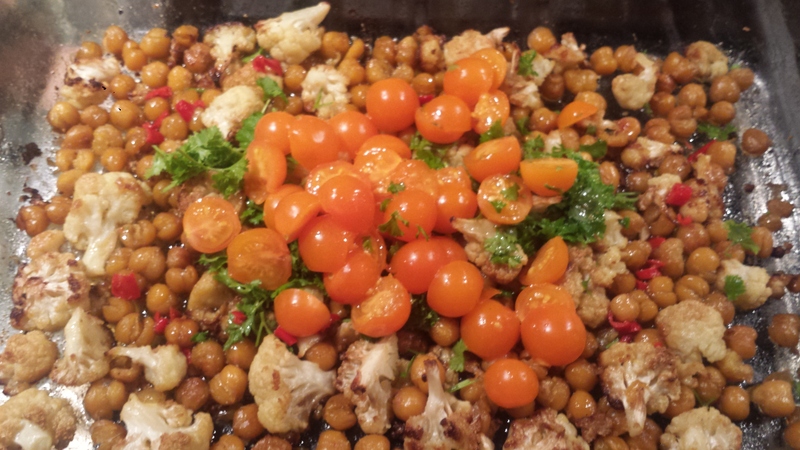 I had remembered that Gwyneth Paltrow had a recipe for Roasted Cauliflower and Chickpeas with Mustard and Parsley. I had great luck with Gwyneth’s famous White Bean and Swiss Chard Soup which was delicious so went back to her cookbook. “It’s All Good” to check out the recipe. Since it’s still summer, barely, (The first day of Fall also known as the Autumnal Equinox is on Tuesday, September 23, 2014, less than two weeks from now.) I decided to swap out the mustard for a dressing made with my fresh herbs and chili peppers along with spices, like cumin and chili powder. 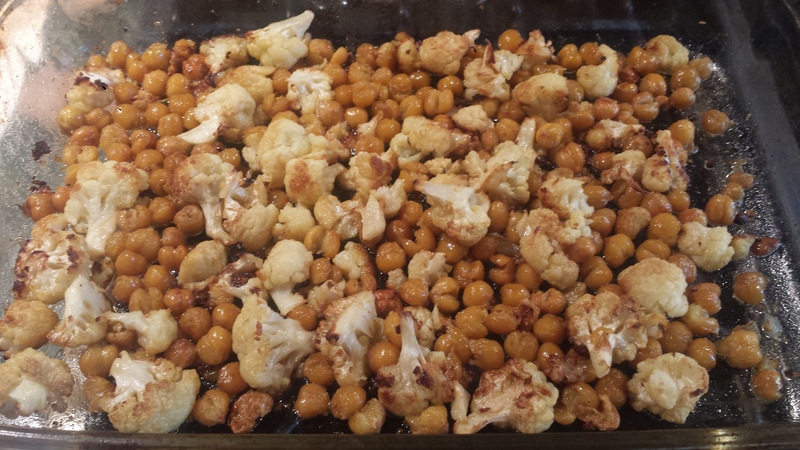 First I roasted the cauliflower and garbanzos and let them cool slightly. Then I drizzled them with the slightly spicy dressing and tossed it all with halved cherry tomatoes, olives and fresh parsley. This is a wonderful, ultra-healthy and satisfying main course, just serve with a side salad. It also makes a great side dish paired with almost anything. In her book, Gwyneth also recommends using the tough outer leaves which are usually removed and discarded. I usually throw them in my green bin or give them to the chickens next door but decided to take Gwyneth up on her challenge. As suggested, I sliced and sautéed them in butter and garlic. What could be bad? I could probably eat my shoes if they were sautéed in butter and garlic… And the result? 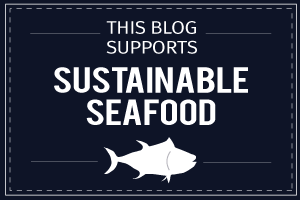 I sprinkled them with sea salt – Delicious! Gwyneth was right. 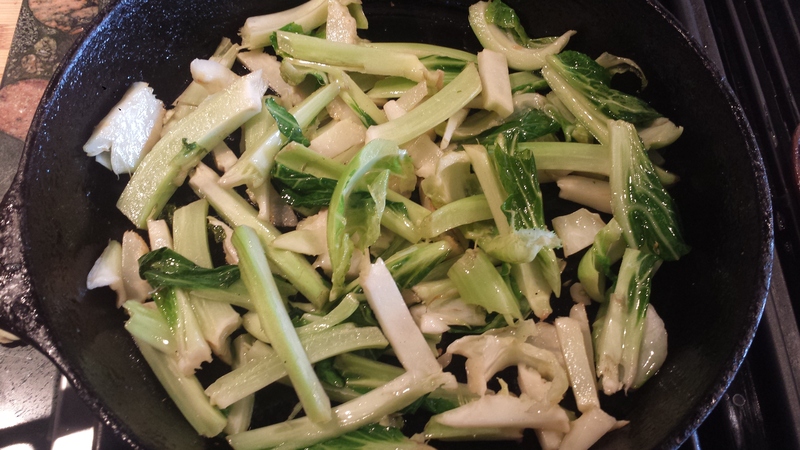 They taste a lot like bok choy but slightly firmer. The best part is that you get a second dish, two for the price of one! TIP: I made this dish more summery by using fresh herbs and spices in the dressing instead of mustard and I also included red chili peppers, cherry tomatoes and olives for a more salady feel. If you would like to make Gwyneth’s original dish, omit the spices, tomatoes and olives. For the dressing, add 1/4 cup olive oil, salt and pepper and 1 tablespoon each, Dijon mustard and seeded mustard. 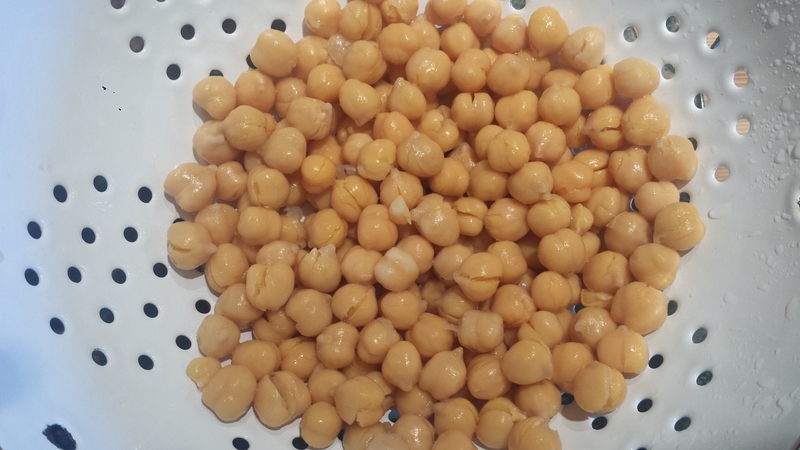 Drain chickpeas and let dry, or dry with towels. 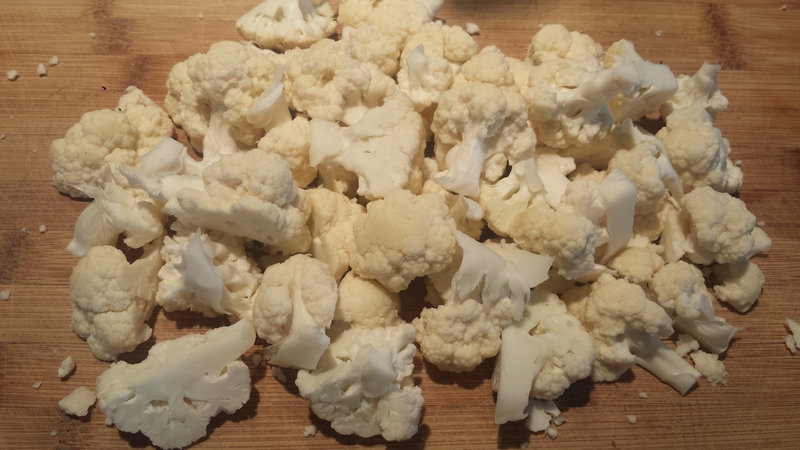 Remove the outer leaves from the head of cauliflower, core and cut into bite-sized florets. Since garbanzos are small, I like to cut the florets pretty small too. 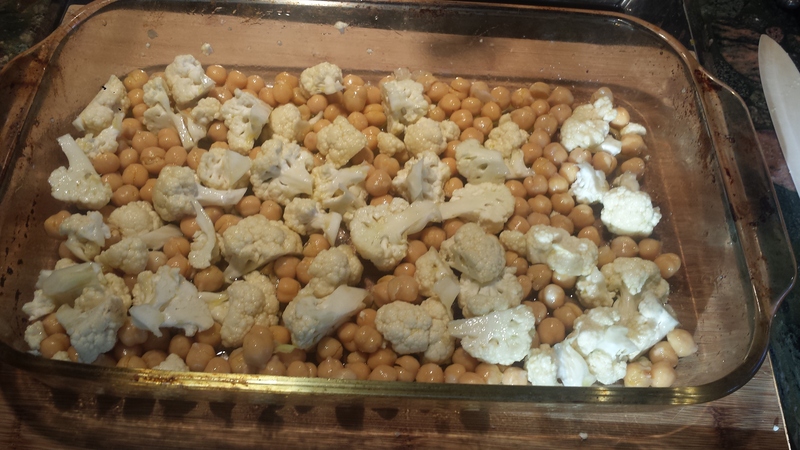 Toss the chickpeas and cauliflower together in a large roasting pan with 3 Tablespoons of olive oil and a big pinch of salt. Roast at 400 degrees for about 45 minutes. Remove from the heat and let cool, slightly, while you make the dressing. Whisk together the oil, vinegar and spices. Add salt and pepper to taste. Add tomatoes, olives and parsley. Drizzle with dressing and gently combine. Serve warm or at room temperature. 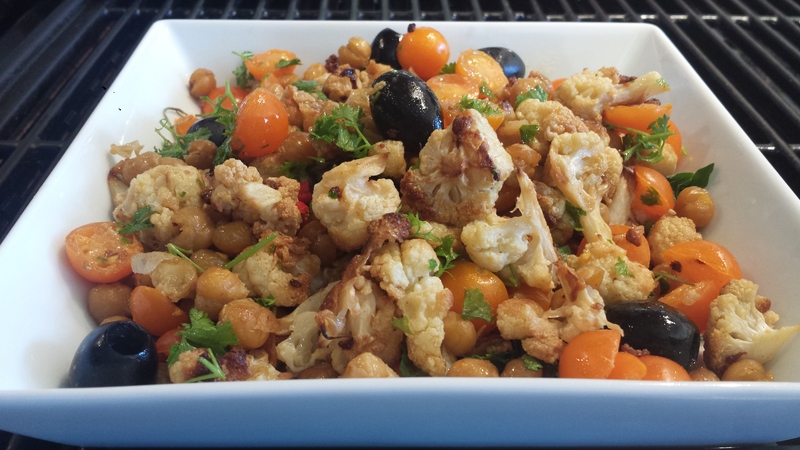 This entry was posted in All Recipes, Salads, Vegan, vegetarian, Wheatless Wednesday and tagged Cauliflower, chili peppers, cumin, gluten free, Gwenyth Paltrows Roasted Cauliflower and Chickpeas with Mustard, Gwyneth Paltrow, It's All Good cookbook, Paleo, red chili peppers, Roasted Cauliflower and Chickpeas with Tomatoes and Olives, Roasted Cauliflower and Garbanzo Beans, Vegan, vegetarian, Wheat Free. Bookmark the permalink.